On April 27th 2009, the new LEED 2009 system replaced the previous LEED rating point system for certifying LEED buildings. Allocating a substantial increase in LEED points to energy measures is a practical change reflecting market conditions. This change makes it probable that a LEED building will qualify for one or more EPAct (Energy Policy Act) IRC Section 179D energy efficiency tax deductions. The USGBC described the changes, stating “overall the changes increase the relative emphasis on the reduction of energy consumption and greenhouse gas admissions associated with the building systems, transportation, the embodied energy of water, the embodied energy of materials and where applicable the solid waste.” Moreover, most buildings built in 2009 are required to comply with local building energy codes that are in most cases substantially higher than those applicable during most of the previous LEED system time period. 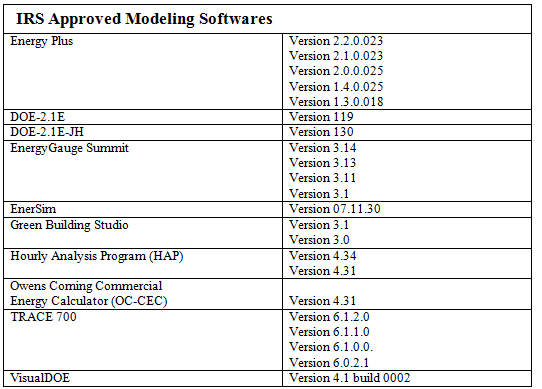 It is important for tax purposes to realize that under both the prior and the new LEED systems, buildings must have supporting designed building energy efficiency computer software models. IRC Section 179D, effective January 1, 2006 through December 31st 2013, provides an immediate tax deduction of up to $1.80 per square foot for building investments that achieve specified energy cost reductions beyond ASHRAE 90.1-2001 building energy code standards. LEED 2009 utilizes ASHRAE 90.1 2007 as its baseline, which is already an improvement over 2001. Therefore, projects that are LEED 2009 certified are naturally platformed for tax savings. A one-time $1.80 per square foot deduction is the maximum tax deduction, but deductions of up to 60 cents per square foot are also available for three types of building systems: lighting, HVAC systems, and the building envelope. Since the USGBC's introduction of LEED in 2000, the rating system has become the national standard for green building certification; more than 21,200 LEED projects have been registered as of May 20092. This number will undoubtedly increase even more quickly with the introduction of the more multifaceted LEED 2009 system, which includes not only the existing categories of LEED for New Construction, Existing Buildings, Operations and Maintenance, Core and Shell, Commercial Interiors, and Schools, but also new categories for Homes and Neighborhoods and Pilot Programs for Retail and Healthcare facilities. The anticipated increase in LEED Projects in the future will be met by the growing number of LEED Accredited Professionals. When the LEED AP credential was created in 2001, 527 professionals chose to pursue the accreditation; today, LEED APs number more than 114,0003. With the increasing amount of both LEED professionals and buildings, the potential for savings under the EPAct should also experience dramatic growth. The establishment of regional bonus points is another practical change reflecting the major differences in regional environments. For example, in the northern U.S., energy efficient heating is important where in the south energy efficient cooling is crucial. In parts of the western U.S., water is a scarce resource. The performance of alternative energy measures such as solar, wind and geothermal are highly dependent on regional factors. The new regional bonus mechanism is to be established by local USGBC chapters which for purposes of the bonus are to be determined by state and U.S. possession designation. This may require some adjustments for national property owners with common building footprints that are striving for a standard LEED qualifying design. The American Society of Heating, Refrigeration and Air Conditioning Engineers (ASHRAE) has been working diligently on proposed Standard 189.1 the nation’s first Green Building energy code�4. This legislation is intended to provide minimum criteria for green building practice with major emphasis on energy and water usage efficiency. The standard is applicable to new commercial buildings and major renovations. When completed this standard is expected to address energy efficiency, a buildings impact on the atmosphere, sustainable sites, water use efficiency, materials and resources, environmental qualify, and other green building issues. A public review draft may be examined at www.ashrae.org/publicreviews. When enacted in each participating state this new code will platform a much higher percentage of new building and major renovation projects for EPAct commercial building energy efficiency tax savings. LEED buildings must be modeled and modeling is mandatory for achieving the $1.80 maximum tax deduction, the HVAC, and the building envelope tax deductions. Building designers including architects, engineers, lighting designers, design and build firms, and ESCOs (energy service companies) involved in LEED government building projects, including K-12 public schools, are also potentially eligible for the EPAct tax incentive. Many federal, state, and local government agencies and school construction authorities require all government buildings to be built at a LEED certified level. Tax professionals involved with LEED buildings should recognize that these projects are often eligible for substantial EPAct tax savings. This is particularly the case for LEED platinum and gold buildings, all buildings that achieved LEED points through energy measures, and new LEED 2009 certified buildings. � Goulding, Charles, & Goldman, Jacob, & DeMarino, Nicole. “LEED Building Tax Opportunities.” Corporate Business Taxation Monthly. January 2008, pages 17, 18 & 19. 2 U.S. Green Building Council. 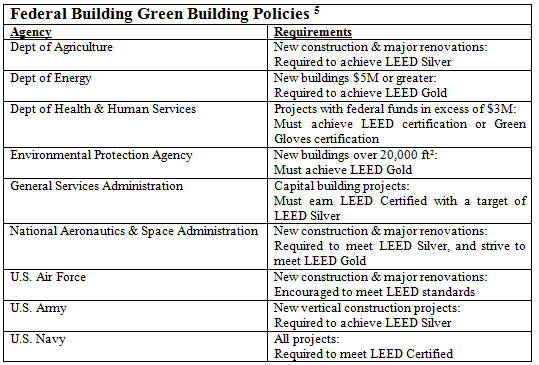 “About LEED.” U.S. Green Building Council. Powerpoint—May 2009. 3 U.S. Green Building Council. “About USGBC.” U.S. Green Building Council. Powerpoint—May 2009. 5 Nassau Academy of Law. Legally Green: How to Make Green by Going Green.” Nassau Academy of Law. Powerpoint – May 4, 2009. Amelia Aboff is a Tax Analyst with Energy Tax Savers, Inc.